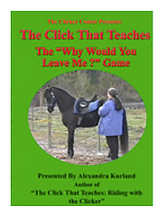 This DVD introduces your horse to leading freely and calmly with no pressure, no forging ahead or lagging behind. This progresses to lateral work on the ground and eventually liberty work. Lateral work is very important for maintaining a sound horse. When perfected, it leads to a wonderfully straight horse.